It wouldn't be any stretch to say that this is one of the most hotly anticipated début albums for a few years. 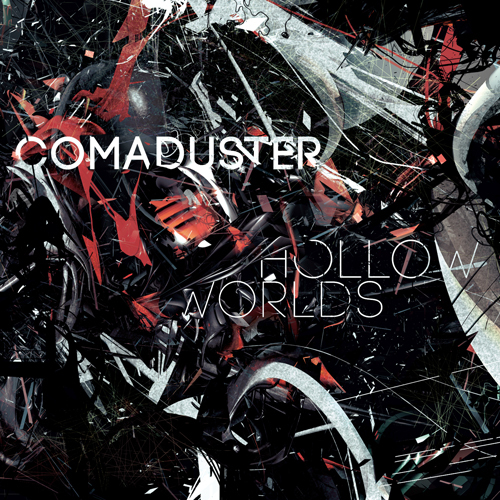 The solo project of Canadian electronic sound designer and musician Réal Cardinal (whose credits already include the Mass Effect and Dragon Age game franchises), Comaduster got tongues wagging with the 2009 self-released EP 'Slip Through' which showed off a penchant for dynamic and intricate genre-blending electro. Fast-forward to 2013 and the long-gestating full-length début is finally ready. With such anticipation surrounding the album you'd be forgiven for thinking that this can't possibly live up to the hype. But it does... and more. 'Hollow Worlds' presents the listener with a complex and visceral blend of industrial, glitch, idm, ambient and post-rock with dubstep and synthpop elements. Such a huge array of styles should ultimately sound like a disjointed mess. Yet Cardinal has crafted a seamless and modern album that is both abrasive and melodic in equal measures. There is an awful lot going on here and for best effect it takes multiple listens to catch every trick and nuance of Cardinal's style. But therein lies its beauty, you can really delve into this and discover something new every time you listen. Songs like 'Winter Eyes', 'Hollow Worlds', 'Walls' and 'Futureproof Design' provide the album with it's more commercial edge. Their blend of hard and complex electro with soaring vocals is intensely catchy and still have a solid grounding in dance rhythms. Whereas tracks like 'Ma', 'Unfound', the eleven-minute-long 'Nightsail', and 'Connecting The Seams' continue to show off the diverse spectrum of his talents taking in which glitchy bass, ambient piano strains and multiple tempo changes are performed with ease and elegance. The biggest revelation though is the sheer quality of Cardinal's vocal performance. Despite the intricate nature of the music, the voice presents itself as the unifying element. Almost the ghost in the machine as it were. It is warm, powerful and emotionally resonant, serving as a linchpin which holds the album together. 'Hollow Worlds' is quite simply an excellent début. In fact it is one of the strongest for a long while. The music is intelligent, yet accessible and the production is absolutely faultless. Anyone seeking challenging electronic music they can groove too as well as get their teeth into will need this album. Let's just hope that we don't have to wait as long for the next Comaduster outing.